The Simpsons Guy, it’s going to go down as one of the best TV crossovers we have ever seen! Yep, I said that! 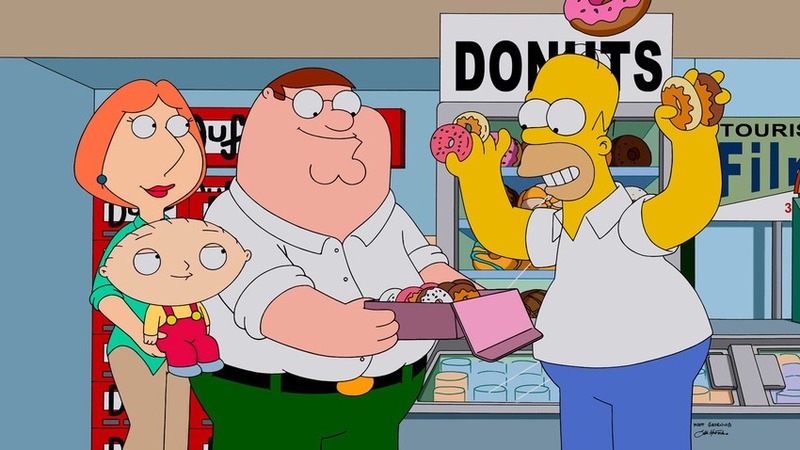 Last Sunday, FOX aired the long awaited crossover between The Simpsons and Family Guy, and it did not disappoint! So below, I am going to talk about the one hour special, if you have not seen it yet, SPOILER ALERT! The special began with Peter getting a job being a cartoonist at the local newspaper. It did not last long, because well, this is Family Guy, and you know there will be something weird in those cartoons, and there were! The Griffins left their hometown for a while to get away from the women protesting them, and while in a gas station, their car got stolen, and they soon figure out they are in the town of Springfield. The Griffins meet Homer Simpson, then the rest of the family, then the great stuff begins! I loved how they could not say which state Springfield is in. Bart was paired with Stewie, and wow did Stewie upset Moe with that prank phone call. Meg was paired with Lisa, and I loved the interactions between these two, we now know that Meg can play the saxophone, very well! Too bad Peter does not realize the potential Meg really has! Marge was paired with Lois, and I wished we saw what they did more! The same goes for Chris and Maggie. Brian paired with Santa’s Little Helper was great, we know now that the Krusty Burger uses dog meat, gross! All throughout the episode, you see plenty of cutaway gags, like seeing Bob from Bob’s Burgers and Cleveland in the airplane gag, and seeing Roger from American Dad as well during that chicken fight. How Family Guy and The Simpsons starts to split apart, beer. Pawtucket Ale was a lousy rip-off of Duff Beer, and soon you see characters from Family Guy and The Simpsons in a courtroom. The judge was Fred Flintstone, and the Kool Aid guy fails to come! I also found the car wash scene as very weird. Yep, two men washing cars in sexual clothing is not very pleasant. I also lived seeing Stewie getting back at Bart’s bully Nelson, why would Bart free Nelson, who knows! The best part was the last 15 minutes when Peter and Homer fight each other in a Family Guy classic, the chicken fight! Seeing all of the Springfield references was sweet! I really loved Homer using those Emmy’s! At the end, both Homer and Peter decide that they should not do another crossover, and each show should stay far apart in their own timeslots. Yep, we now see why Family Guy and The Simpsons stay far apart in their own timeslots. The ending when Stewie writes “I will not think about Bart again” on a blackboard in his room was a very fitting ending to this special! So, I thought there was plenty of humor and laughter in the crossover. 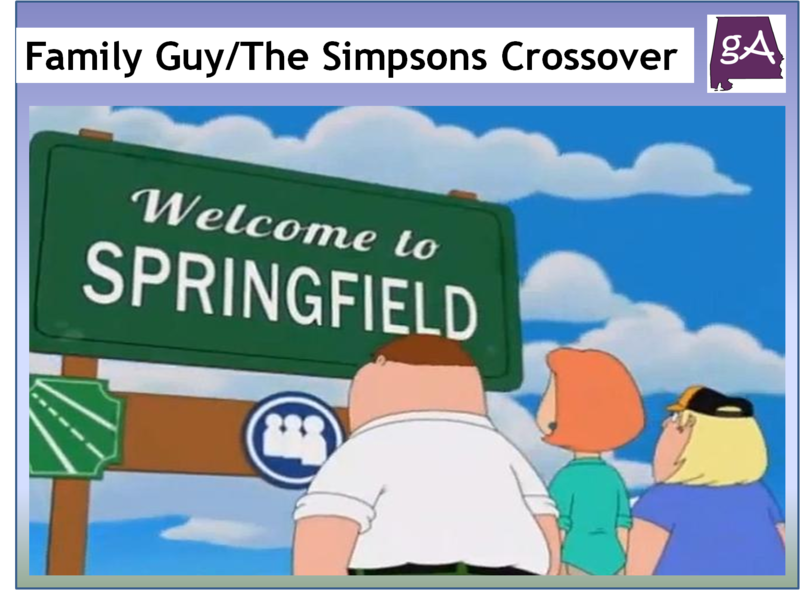 There was many gag moments, Easter eggs, and plenty of references from The Simpsons and Family Guy, and a few other shows as well. I thought the crossover worked! 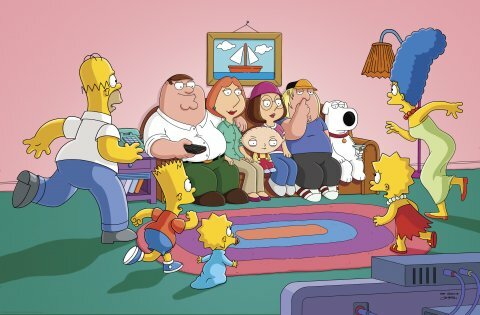 And the characters from both Family Guy and The Simpsons brought awesomeness to this crossover! At the beginning, they even talked about how crossover episodes don’t work, but this crossover works! I enjoyed The Simpsons Guy, and you will too!